Family Tree DNA has a new issue of Facts & Genes available on their website.Â If you didn’t receive this newsletter but would like to receive it in the future, you can register here. I especially like the “Case Study in Genetic Genealogy”, which is reprinted in full below.Â I, like others, sometimes jump too quickly to the conclusion that there has been a non-paternal event in a line. When I [“I” being a hypothetic someone who has tested through a genetic genealogy company] first tested, I had no matches with my surname, and a match with another surname. I was told that there was an event in the past, breaking the link of the Y chromosome and the surname – an illegitimacy. Several years later, I now have matches with 3 other surnames, and no match with my surname. I am thoroughly confused. How can you explain this? 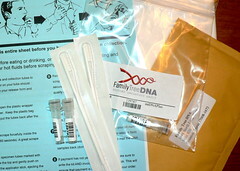 A conclusion of an illegitimate event, or other events that can break the link between the Y chromosome and surname, such as adoption, infidelity, and name change, should only be made after significant research, and testing all or at least the majority of the family trees that exist for the surname. A surname distribution map of your surname in the ancestral country shows approximately 150 origins for the surname. This is not unusual for an occupational surname. In your Surname Project, there are only 15 different groups of results – representing approximately 10% of the possible results for the surname. Most likely you will find a match with your surname as more people test. Keep in mind that for any surname, some Y-DNA results will ramify, while others will have a smaller population. This may mean that the Surname Project has one large group who match and other smaller groups. This situation could also depend on where recruiting has taken place. In addition, some Y-DNA results for the surname may not be represented in your country beyond your family tree, but may be found in the ancestral country or another destination country. I realize that one of the surnames you match is found in the same county as your surname in the 1800s. This is not sufficient evidence that an event occurred, such as illegitimacy. Unless there is documented evidence, and until a majority of the family trees for a surname and variants are tested, it is recommended that where a result has no matches yet with the surname, a conclusion is not made until sufficient testing occurs. Reprinted courtesy of Family Tree DNA (Copyright 2008, Family Tree DNA). It is amazing what you can learn with DNA. Technology is so interesting. Who knows what they will come up with next?